What a great recipe, Jess! I am banking this refreshing dessert for when the temps heat up here in Phoenix which should be about, oh…four days from now. I love your Grand Marnier sub; I think I’d like that flavor better. The alcohol, even a tiny splash, helps with the consistency because it requires a lower freezing temp, which keeps the sorbet from getting too hard. Love the photos, too! This looks beautiful and I love that it is a fairly heathly dessert option. I think I will add this to our V-day menu! ps-about how much does this make? Thanks for asking, I forgot to include that! The recipe said it would make 3 cups but I got just under 2 1/2 cups. How gorgeous is this dessert! I keep forgetting about making sorbets when thinking of sweet treats. Luckily for us SoCal peeps, we have fresh strawberries all the time. I think it’s time to bust out the ice cream maker and make a pint or two of this!! YUM! I would LOVE to make this for Valentine’s Day. I have been looking for healthy ideas and this one is perfect!!! I just can’t get good strawberries anywhere…good thing Strawberry season is right around the corner for us on the east cost of the USA. 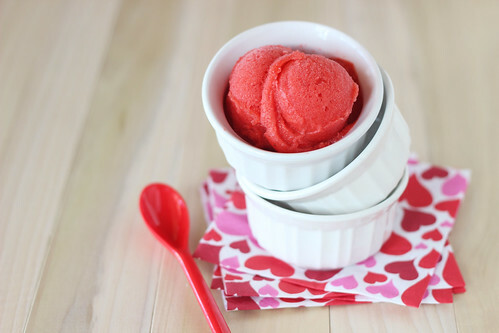 This has become my “go to” strawberry sorbet recipe. I’ve made it many times over the last few summers. 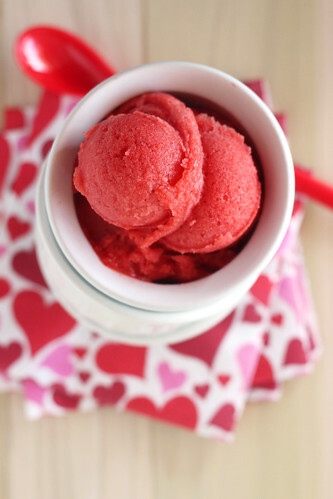 The strawberry flavor really stands out because you don’t dilute the mashed strawberries with water…just add sugar. The little bit of alcohol keeps the sorbet from getting rock hard in the freezer. Try this recipe before you try any others.